“The Lord has appeared of old to me, saying: “Yes, I have loved you with an everlasting love; therefore with lovingkindness I have drawn you” Jeremiah 31:3. If you’re anything like me, you’re a total softie for sweet words. And when people speak kind, loving words to me, they mean the world to me. Of course, they have to be backed up by actions–I’m not so naive that I’ll believe words that are clearly spoken only to manipulate–but kind, sweet, loving words grip my heart. Every time. Yup. I love words of affirmation. But I’ll bet you love words of affirmation too. Has anyone ever said anything that was precious to you, right when you needed it? Do you still cherish the memory of what they said? Do you remember how you felt when someone said sweet words to you–words that meant more than you could ever express? That feeling you had when someone spoke kinds words to you is part of what it feels like to be loved. Think some about the people you love: your spouse, children, friends, family, church family, etc. 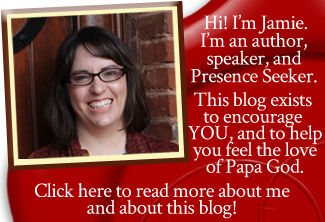 Can you think of specific times when you have spoken encouraging words to them? Have you comforted them when they were sad? Have you complimented them when they look nice, or when they did something well? Have you told them they’re great, just because you’re overwhelmed with love for them? If so, you did so because you loved them. You were reaching out with your words to love on someone else, and you used words of affirmation as your tool to show your love. Words of affirmation are a huge way to convey love, affection, respect, esteem, honor, and everything else good. That’s why God is into words of affirmation. He thinks you’re great, and He’s beside Himself finding new ways to tell you so. “I have loved you with an everlasting love” (Jeremiah 31:3). “Fear not, for I have redeemed you; I have called you by your name; You are Mine” (Isaiah 43:1). “Since you were precious in My sight, you have been honored, and I have loved you; therefore I will give men for you, and people for your life” (Isaiah 43:4). “As the Father loved Me, I also have loved you; abide in My love” (John 15:9). 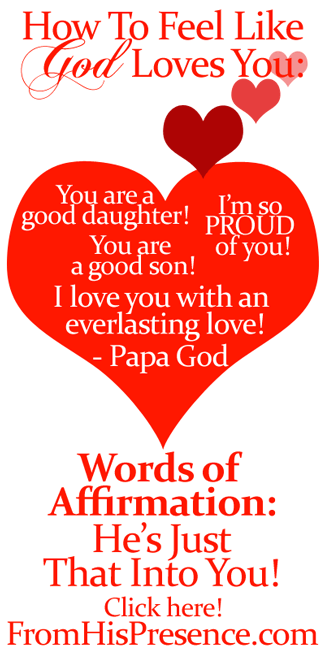 Daddy God’s words of affirmation go on, and on, and on. You could read them all day … all year … forever… and never come to the end of God’s ministry through words. I dare you to do it… because I guarantee that He will surprise you. Your Papa God will tell you how much He loves you, and how much fun He has spending time with you, and how wonderful He thinks you are. Sit back and soak in His amazing words. This is what it feels like to be loved: to be affirmed by precious, loving words from someone who adores you. God adores you, so He can’t wait to tell you so. Will you let Him? Right now? After all, He’s just that into you. 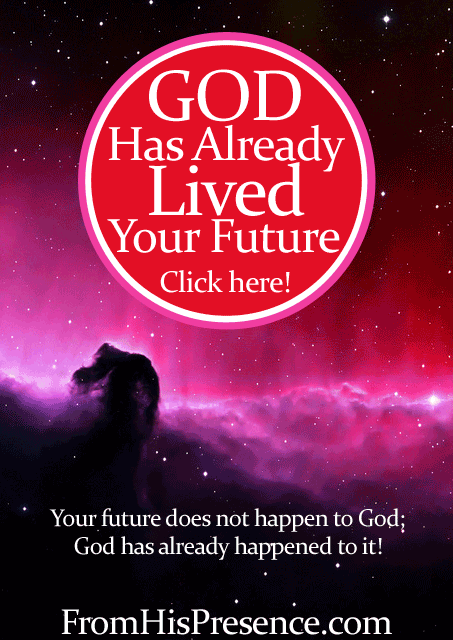 Did this message encourage you? 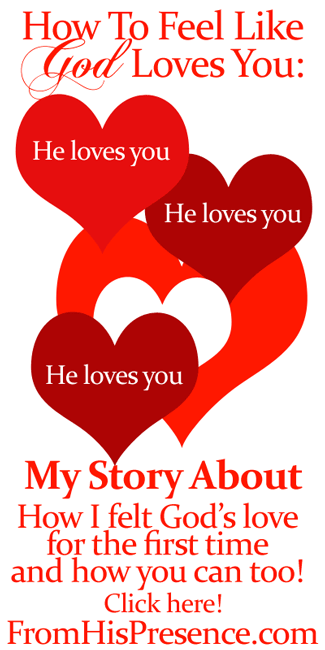 Did you feel God’s love while reading it? If so, please leave a comment below. I’d love to hear your thoughts! As I shared in The Solution to Fear (Part 1): How God Delivered Me From Fear, I used to be very afraid. I was especially fearful of people; I was shy and didn’t know how to reach out. However, God has changed my heart, and I’m no longer shy. I truly love people now. In this post, I’m going to share my story about how to overcome shyness so you can have true, covenant friendships and love people the way God calls us to. Maybe you desire to have more friends, but you don’t know who to talk to or how to start a conversation. So you sit alone at lunch, at work, and everywhere you go, lonely. Maybe your church has an inner-city evangelism team, and you really feel called to that ministry; but you’re shy and can’t imagine yourself talking with people. So you feel like you’re missing out on your call in life. Maybe you know someone is hurting, but you feel too intimidated by the size of their problem to try to help them. You want to help, but you feel like you have nothing to offer. Sound familiar? I thought so. I have dealt with all of these manifestations of fear also. And every one of these, precious reader, are tricks from the enemy. You can be totally free from all of these things. You can completely overcome fear in EVERY ONE of its manifestations. 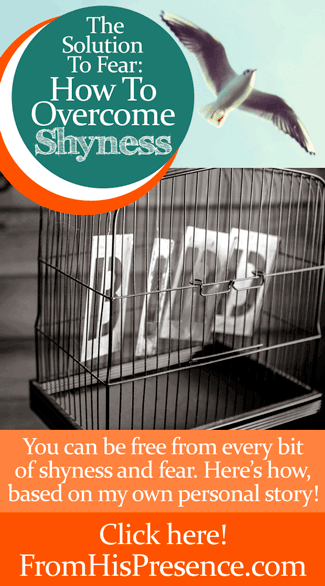 That means you can overcome shyness too. There IS a solution. This entry is part 4 of 10 in the series Who is God? Do you feel like you need a new start? A new beginning–a reboot–a do-over? If so, today is your day, because God is a Renewer. New starts are what He DOES. 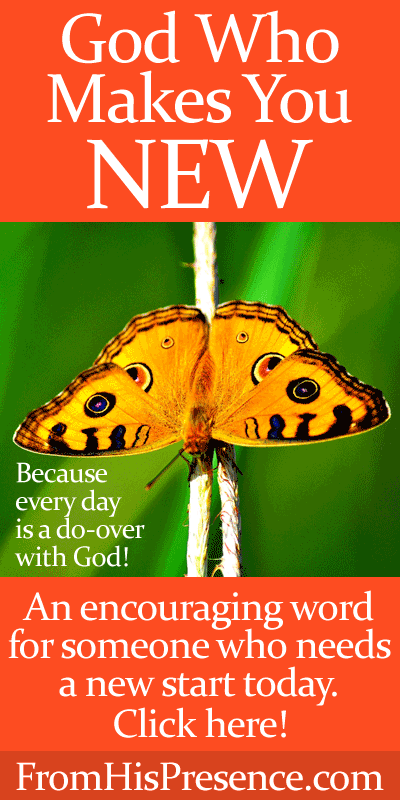 How do I know God will give you a new start? Because God is a Renewer. Let’s stop right there and look at the word “renew.” When you add “re-” onto the beginning of a word, it means you are doing something again. Think of the words “redo,” “replenish,” “restore.” To “re-” something is to bring it back to its original intent. When God made Adam and Eve in the Garden of Eden, Adam and Eve were perfect. They had not sinned, and they walked with the Lord in perfect companionship. But then they made the choice to rebel against God. They sinned and fell away from relationship with their Father God, and humans have been sinning ever since. But God! He is so amazing. His heart is to restore. His heart is to redeem. His heart is to fix what we have broken. God is a “Re-God”… the one Who makes all things new. He loves to bring you back into His original intent for you. What does this mean to you if you need a new start? 1. It means God will give you the new start you need, in any area of life. Have you made mistakes in certain situations? Ask Him to make those situations new, and He will. Do you need a total reboot, a total do-over? Get alone with God and pour out your heart to Him. He will give you the do-over you need. You will feel completely new after you’ve poured it all out to God in prayer. It’s true that you may need to make some things right… with God and with people. But God will lead you through those situations. He’ll give you the wisdom and the words to say. He’ll give you the broken and contrite heart you need. This entry is part 10 of 10 in the series Who is God? Have you noticed that you can learn new things about God anywhere, if you will just look for Him? 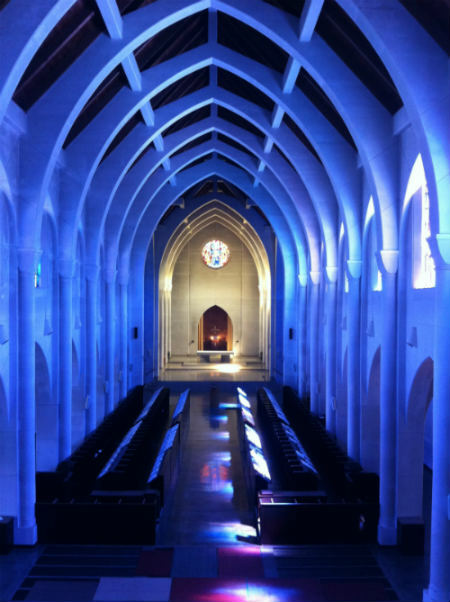 I love to look for hints and clues about God’s character in untraditional places, and architecture is one of those untraditional things that can be a great demonstration of God’s character. I know we usually think of architecture as a way to manufacture shelter, hopefully with beauty that is pleasing to the eye and functional for everyday life. However, some of the most beautiful architecture in the world wasn’t done for the purpose of just being practical; it was used as worship. Architecture has been used to worship and glorify God for thousands of years. 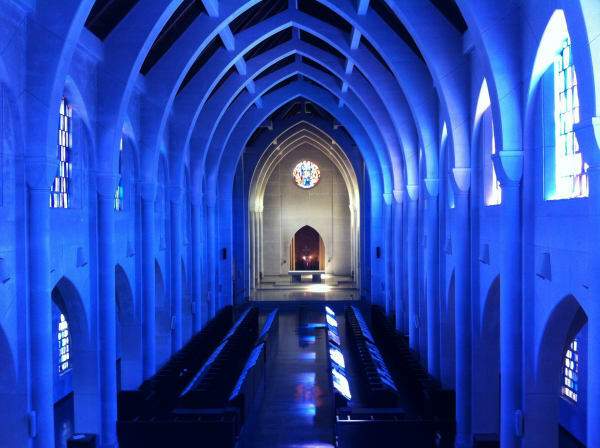 The chapel is not actually blue, but the stained glass windows have a lot of blue in them, so the windows put a blue cast on everything. But in reality, the columns and arches are all whitish-gray concrete. This entire church was molded, framed, and poured by hand by the Trappist monks that live there. It’s amazing. As I sat in the balcony, I was overwhelmed by the Presence of the Lord there. He was so heavy. You could feel Him so powerfully that I just sat there and cried and cried, and looking at the beauty of the building brought me a deeper revelation of His majesty. God is everywhere. His majesty is on display for all to see. Let’s look for Him everywhere we go today, shall we? This entry is part 9 of 10 in the series Who is God? Last night, I had the privilege to attend a conference meeting at Fuse Church where Bill Johnson, Senior Pastor of Bethel Church in Redding, California, was speaking. It was awesome. For the first time, I saw the terror of the Lord. 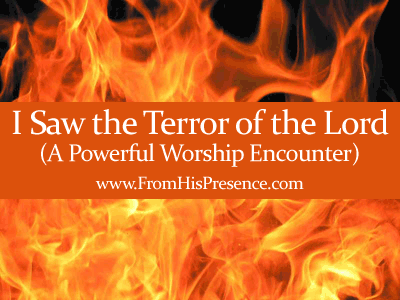 What do I mean by “terror of the Lord”? Well, before worship–actually right when Bill Johnson walked in the room, because he carries so much of the Presence of the Lord–and during worship, the Lord revealed a side of Himself that I had never encountered before: His terrible-ness. I caught just a glimpse of how powerful He is, and how awesome, and how totally other He is. God is not like me. Am I made in His image? Yes. But God is not like me. Seeing this side of Him first-hand inspired me to fear. Was it a holy fear? Yes. It was not a demonic fear. But it was fear nonetheless. It wasn’t just respect, and maybe there’s a better word for it than “fear,” but if there is I don’t know what it is. So I can only use the language I have to describe how I felt when He revealed Himself to me.